I know every month flies by but for some reason October seemed to pass faster than most, how on earth is it November tomorrow? When I look back at all of the things that I got up to in October I realise how much I packed in, it really has been a month of brilliant adventures and great discoveries. The ultimate obsession has definitely been A Star is Born (who's seen it? ), I'm obsessively listening to the soundtrack and am beginning to think I need to go and see it again! Here are just a few of the things that didn't make the blog this month. How can you have lived in Newcastle for six years yet never taken a stroll over the Tyne Bridge? Sounds a little daft doesn't it, but somehow that happened to me. Last weekend, with a spare few minutes to kill I decided to go for a wander and was greeted by the most spectacular views across the Tyne that truly took my breath away. It was a special moment, and for a few glorious minutes it was like I was seeing Newcastle for the very first time. If you haven't admired the views from the bridge for a while go and take a walk soon, the views are incredible. Last month I declared my love for solo adventures in Newcastle and this month I decided to go it alone in Sunderland. With Simon housebound with man flu I couldn't stand sitting indoors on such a beautiful sunny Saturday so decided to go and explore Wearside. I walked for miles, got chatting to so many lovely people (an advantage of being on your own!) and discovered some of Sunderland's very best offerings. I sipped a coffee at Holmeside, got lost in the jungle at the Winter Gardens and enjoyed a G&T at Bonded Warehouse. I enjoyed my adventure so much that I've decided to start working on a blog post about the very best bits of Sunderland so if you have any recommendations make sure you send them my way! Having enjoyed a lot of afternoon teas you could say that Simon and I are scone experts so when we discovered that local bakers Scone Drops make homemade bite sized scones that you can get delivered to your door it felt like Christmas had come early! Ideal for Bake Off Night (I always get SO hungry when I watch Bake Off! ), taking round to a friend's house or creating your own afternoon tea - we enjoyed ours warm from the oven with a huge dollop of cream! There are 12 flavours to choose from including Chocolate & Toffee Fudge, Sweet Cherry and Strawberry & White Chocolate or if you prefer savoury Feta & Caramelised Onion, Simple Cheese and Sun-dried Tomatoes & Parmesan. They are seriously delicious and if you fancy trying some for yourself you can order yourself some from their website here - and if you live in Tyne and Wear you should be able to get some delivered to your door so you can enjoy them in your PJs! When it comes to decorating our home (which we've now lived in for three years but never really finished!) I am so lazy! With my interior flair somewhat lacking I rely heavily on framed prints to add a bit of personality and style to our home and this new one from local hand lettering experts The Little Confetti Co has taken price of place in my office. It's very me isn't it? A reminder that the promise of exploration and adventure is the very best way to pull you through even the dreariest of Mondays. 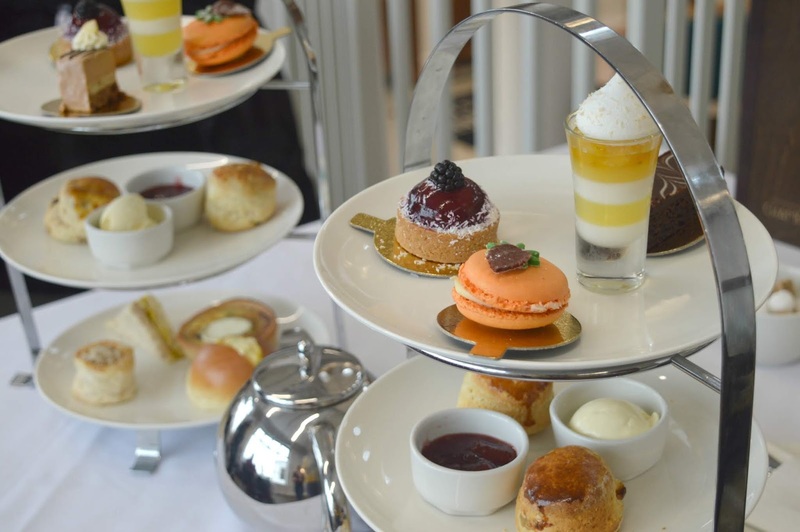 Some afternoon teas arrive and are so overwhelming you really don't know where to start. That was exactly what happened to us at South Causey Inn this month when we were presented with picnic benches of treats that filled our entire table and were packed so high we couldn't actually see each other over the top of them (to be fair I'm sure my husband would much rather gaze at a pile of cakes than my face!) If you want to enjoy an afternoon tea packed full of fun and so much food you'll take half of it home you need to check this one out! My friend Kelly has been going on and on about the amazing coffee at Relish in Whitley Bay for so long now I thought I'd best meet her there for a coffee date just to shut her up! Well, let's just say the girl knows her coffee because this little spot at the coast is real gem and make the best mug of hot coffee, the perfect fuel for a brisk stroll along the seafront. They also happen to be the friendliest bunch of people you could ever meet so I highly suggest you all pop by soon to say hello! Writing this blog has lead to some wonderful new friendships and this month I met my lovely Instagram pal Melis for the first time. Having followed her adventures in Singapore on Instagram for some time I was excited to finally meet her in person when she moved back home to the North East this month. We stuffed ourselves silly in Kiln (their brunches are so good! ), exchanged life stories and gossiped until we realised the entire cafe had filled up around us. It's not always easy to make new friendships as an adult which makes me so thankful I live in such an openly friendly city! I like to think that the warmth of the north is beginning to rub off on this southern girl! Now I'm all about the pumpkin spice lattes and the pumpkin pies, but pumpkin ice-cream was a pretty new concept to me so as soon as I heard that Scoop and Bean were serving up delicious pumpkin ice-cream on their counter I had to get myself to South Shields to try a cone. Oh wow, it was so good! Suddenly eating ice-cream on a freezing cold day at the coast was the very best idea, I can't wait to go back for more. For more adventures from New Girl in Toon make sure you follow me on Instagram. 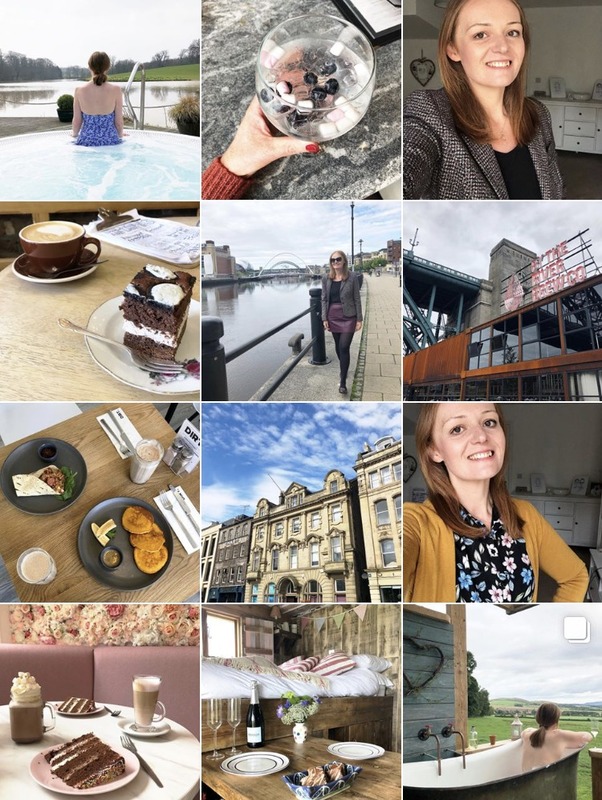 I posts a new photo every day and you'll find video diaries from all of my favourite North East adventures in my highlights. Autumn is, without a doubt, my favourite season and I just love getting out and about exploring the region in Fall. Skipping through piles of leaves, enjoying the sunshine and eating all of the seasonal treats, the North East truly comes alive during the Autumn months and my list of things to do is never ending. The best Autumn Days out in the North East are enjoyed wearing your favourite boots, in the company of your loved ones and carrying a hot cup of something lovely. I hope you enjoy some of my Autumn recommendations and if you have any places that you love to head for the best Autumn days out in the North East, I'd love to hear them. If I had any kind of crafting talent (unfortunately I really don't!) I would definitely be booking myself on to a seasonal flower course and I would absolutely love a beautiful Autumnal wreath for my front door. The stunning orange and red berries of Autumn would make beautiful displays for our house. 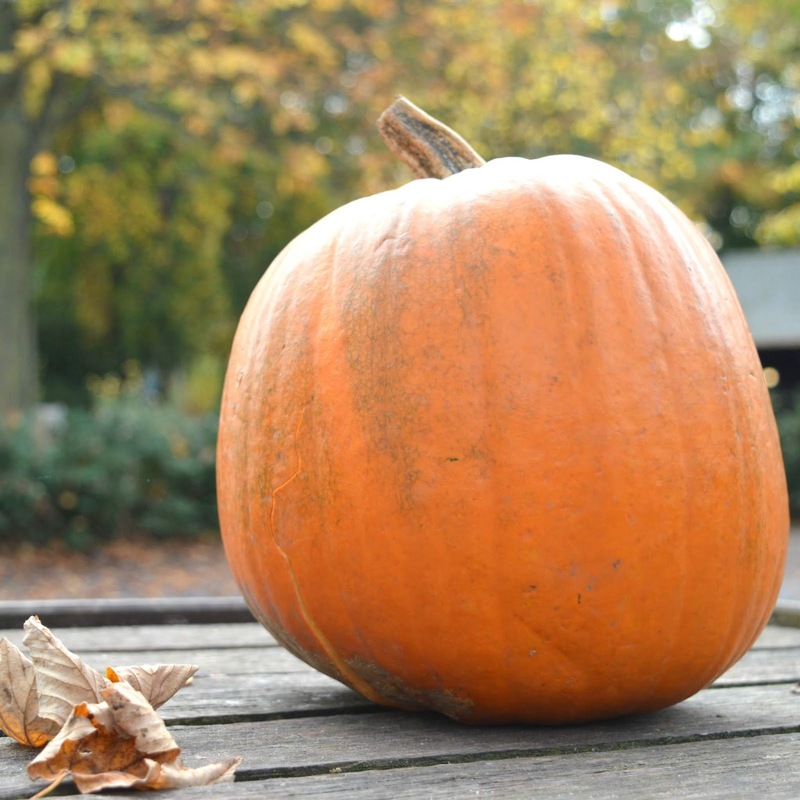 You can't really talk about the best Autumn Days out in the North East without mentioning pumpkin picking can you? Every year I say we're going to go and every year we don't quite make it so I'm yet to tick this one off my bucket list. Picking your own pumpkin to decorate is one of the greatest ways to celebrate Autumn. Autumn is my favourite time for supper clubs, eating seasonal food with likeminded foodies is the best way to spend an evening and here in the North East we have some fantastic places to enjoy pop up nights. Snuggle up by candlelight, dive into some delicious local produce and make some new friends, if you're yet to enjoy a supper club experience Autumn is a great time for your first. I'd never seen a red squirrel in real life until I relocated to the North East and now I've been lucky enough to see a fair few. Although they are pretty easy to spot in the region each time we see one it still feels really special and we love taking the opportunity to go red squirrel spotting. 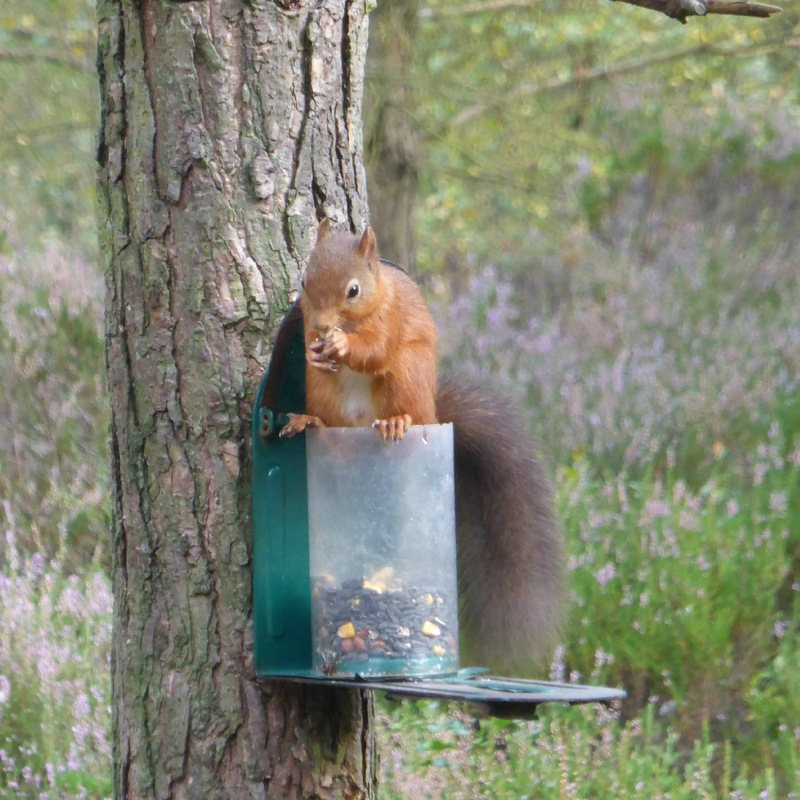 Autumn is prime time to see red squirrels as they scuttle down from the trees to search for food for the Winter, if you're yet to see one of these beauties this is a must for your Autumn bucket list! I could happily walk for hours and hours during the Autumn months, skipping my way through crispy leaves and admiring the stunning colours is the best way to enjoy one of natures true wonders and I like to get out as much as I can during the season to admire the stunning scenery before it gives way to the dark Winter months. Dining in a treehouse, doesn't that just sound like the Autumnal dream, and luckily here in the North East that dream can become a reality thanks to The Treehouse at Alnwick (which I STILL haven't been to!). Swinging rope bridges, log fires and fairylights, dining amongst the trees sounds so beautiful and I'm determined we're going to get there before Autumn is over! Sometimes a day just isn't enough for an Autumn adventure! 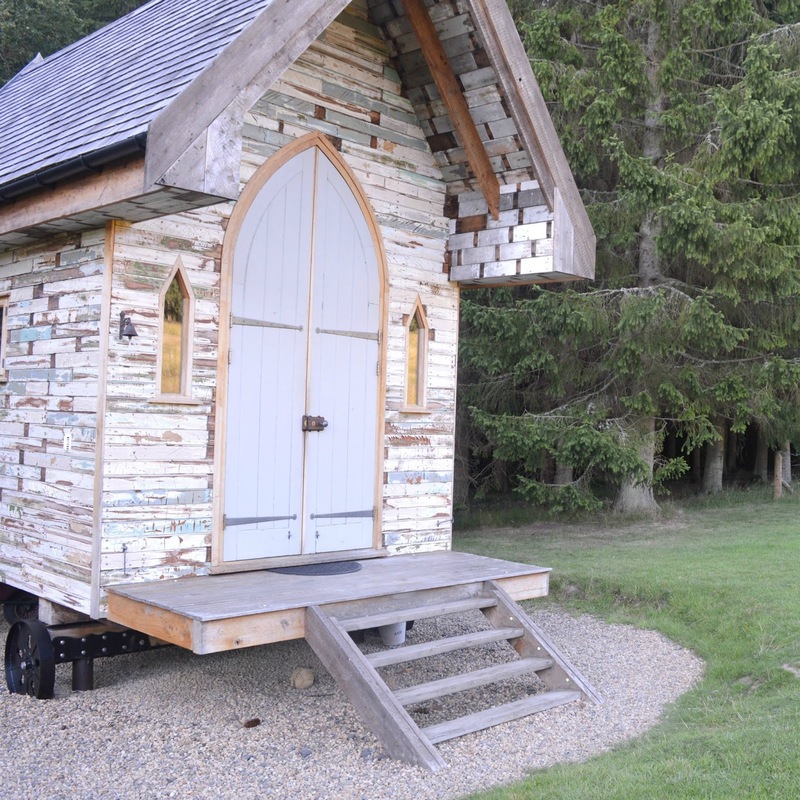 If you want to truly throw yourself into Autumn then I highly recommend a woodland staycation at Hesleyside Huts in Northumberland - a luxury glamping experience amongst the trees with a cosy hut for two, red squirrels on your doorstep and the opportunity to enjoy the perfect night skies. Those are just a few of my ideas of how to enjoy the best Autumn days out in the North East but I'd love to hear yours! How do you love to enjoy the season? Ever since the grand reopening of Spanish City at Whitley Bay and my first little look inside the stunning building I've been dreaming about returning to try out some of the delicious food they have on offer inside but where to start? Fish and Chips at Trenchers? 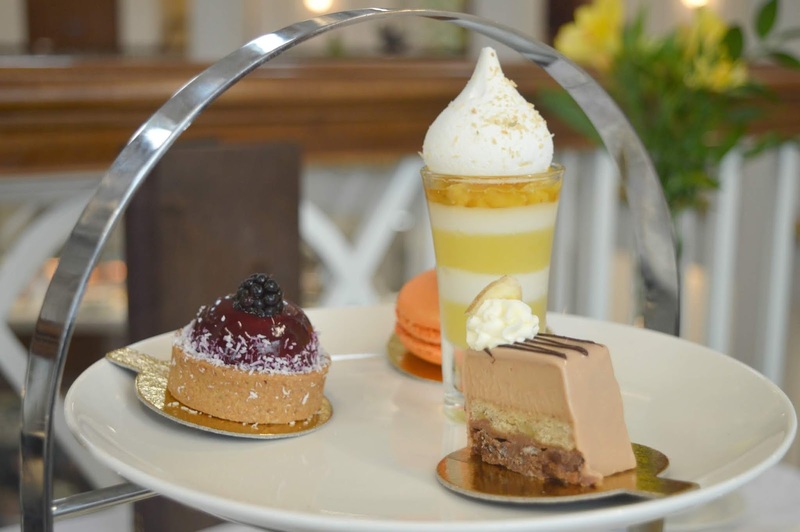 Dessert in the Waffle House, Coffee at Valeries or how about an indulgent Afternoon Tea? Correct me if I'm wrong, but I'm pretty sure that Spanish City is the only place in Whitley Bay where you can have a proper fancy sit down afternoon tea and it's something I've been looking forward to ever since I first heard that afternoon teas would be served at Spanish City. Cake stands at the seaside is my idea of heaven - what a perfect combination. 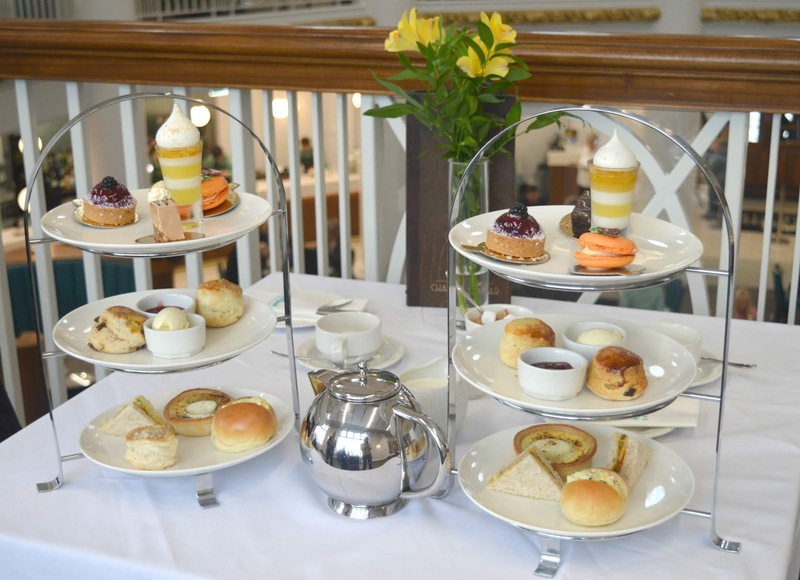 So for my first dining experience at Spanish City it only seemed right that I start with an afternoon tea and of course I knew you'd all be interested to hear about it - so grab a cuppa (and maybe a plate of sandwiches to stop you getting peckish) and let's chat! Before I went for afternoon tea at Spanish City I had thought you could only have it inside Valerie's Tea Room but was delighted to discover that afternoon tea is also served, depending on the day, in 1910 or The Gallery under the Dome which, I think you'll agree, makes the whole experience rather lovely. My table for two was booked for a Sunday afternoon in The Gallery. The Gallery runs round the upper balcony, underneath the Dome with the most beautiful views of that gorgeous ceiling and the opportunity to have a little spy on people below you in Trenchers tucking into their fish and chips. When I first looked round Spanish City I had no idea they'd be using this space for afternoon tea and I'm so glad they are as it's a prime location for an indulgent afternoon tea. We were very lucky that there was a live band playing during our visit which made our experience even more special. 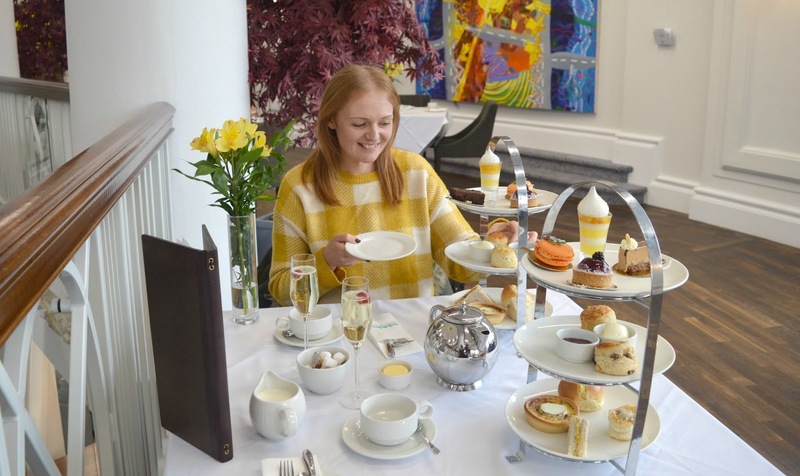 With our booking perfectly timed for the launch of the new Autumn Afternoon Tea, I was looking forward to trying out the seasonal twists on the new look menu. I love the flavours of Fall and couldn't wait to get stuck in. 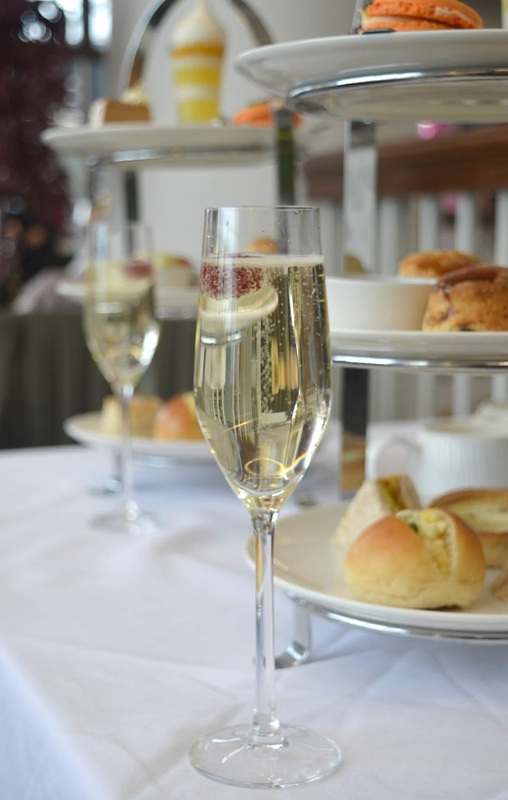 Afternoon Tea at Spanish City costs £19.95 per person and if you fancy a glass of something fizzy to go with it you can enjoy a glass of Prosecco for £5.45 or Champagne for £7.95. Definitely not the most expensive afternoon tea in the North East, but certainly not the cheapest. I was interested to see if the cake stand was worth the price tag. Our savoury tier was packed with goodies and I was really happy that it wasn't just the usual selection of sandwiches with some good variety to enjoy. Chicken, Mushroom and Tarragon Vol Au Vent, Egg and Cress served on a brioche bun, Caramelised Onion & Golden Cross Goats Cheese Tart and Kettle Ham and Piccalilli served on Brown Bread. All perfect and a delicious start to our tea. Moving up to my favourite part of any afternoon tea, the scones. There are two on the tier at Spanish City with Colliers Mature Cheddar served with Butter and Spiced Autumn Fruit with Clotted Cream and Homemade Strawberry Jam. When it comes to scones on an afternoon tea I am VERY fussy and not easily impressed. Personally I think they make or break an afternoon tea and can't help but be left disappointed if they're not spot on. So I'm really pleased to report that the scones at Spanish City are really very good. 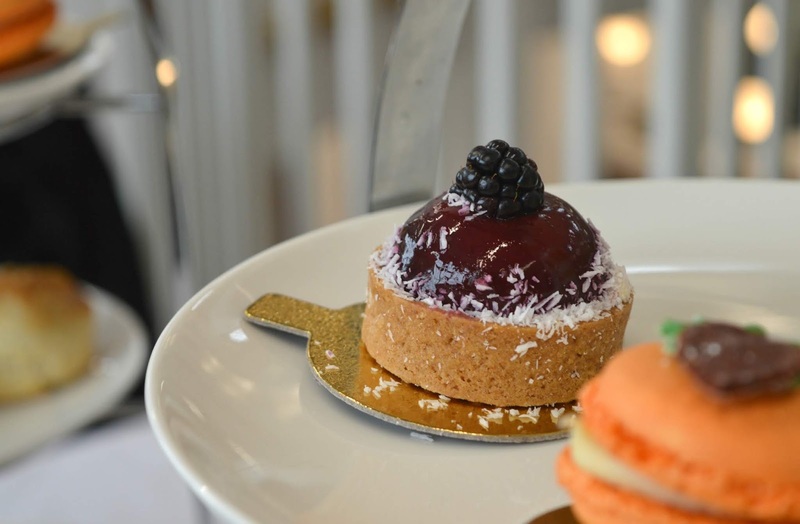 The perfect size for an afternoon tea with a lovely soft inside - heaven! The Pina Colada Sundae with Coconut Pavlova was the perfect place to start (always start with the lighter bites first to save room for the really naughty stuff!) It was deliciously light and creamy and a great promise for what was to come. Unfortunately, due to my nut allergy, I couldn't try the Banana and Caramel Truffle, but I was really happy that I was given a lovely alternative instead. I really don't like when I'm given a poor substitution because of my allergy so was really happy with my little Chocolate slice as an indulgent replacement. The Blackberry and Apple Cheesecake was a really tasty seasonal treat, I particularly love blackberries in the Autumn, they always take me back to my childhood, cycling our way down the little country lanes in the village picking blackberries from the bushes and eating so many that our fingers and mouths would turn purple. The cake that I'd been most excited about was the Spiced Pumpkin Macaron so I had to save it to last. Oh wow, what a special treat! At this time of year I would happily eat Pumpkin flavour everything so to have a pumpkin macaron was brilliant. 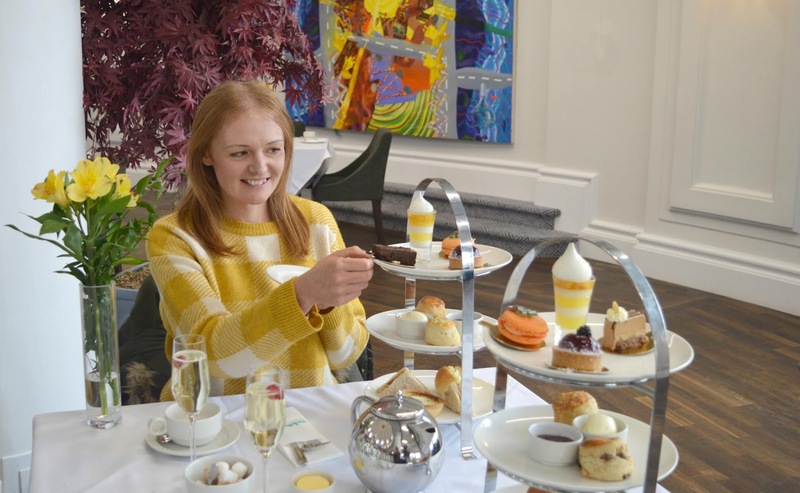 I really can't fault the afternoon tea at Spanish City, the setting was beautiful, the service was attentive and the food was really very good, it has definitely made it to my list of best afternoon teas in the North East. If you're looking for a special treat at the seaside this season I highly recommend booking yourself the afternoon tea at Spanish City. We were invited to Spanish City for a complimentary afternoon tea for two in exchange for this honest review. I'm not sure when my obsession with drive in cinemas first began. It may have been back in my childhood watching John Travolta crooning "Sandy" or perhaps it was the Girls Aloud video to The Promise, but at some moment in time I decided that I really wanted to watch a film from my car. At the weekend, thanks to the Drive In Cinema at South Shields that dream finally became a reality. 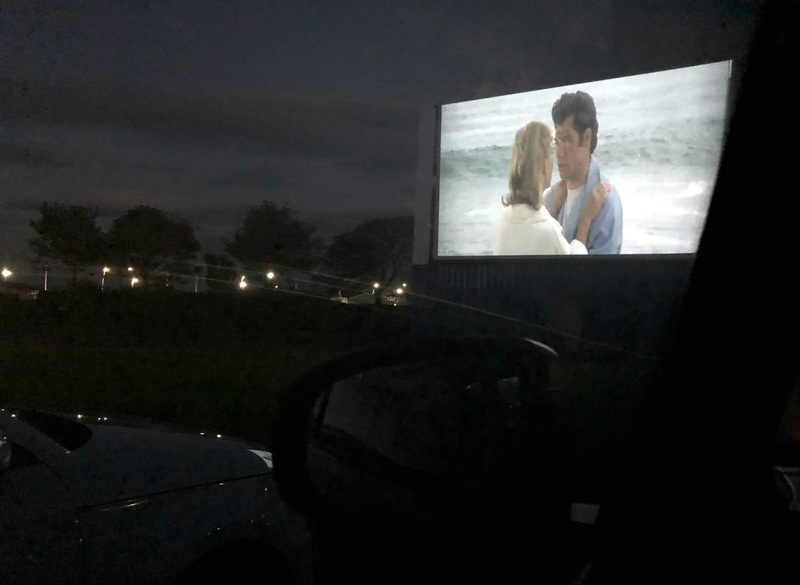 When I first told my husband that I wanted to go to the Drive in Cinema at South Shields, he rolled his eyes and retorted "why would you want to go and watch a film in your car?" Despite being a huge fan of movies, it seems the novelty of watching movies in weird and wonderful places doesn't appeal to him as much as it does to me. He reluctantly agreed, requesting that we go and see "Batman Returns", which I, of course, ignored and promptly organised us tickets for classic flick Grease. 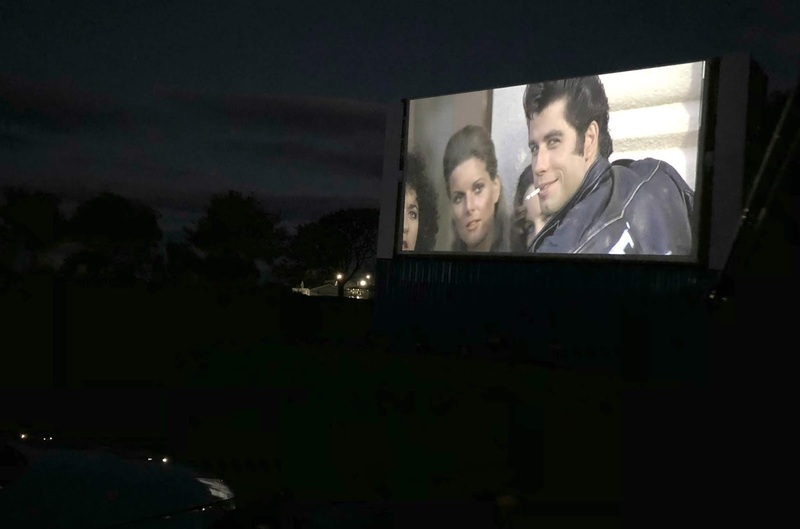 The Drive in Cinema at Bents Park in South Shields opened at the weekend with Back to the Future and will finish its three week run with a repeat showing of Grease. Films are showing every night and there really is a film for every taste, from classics like The Goonies, to recent blockbusters like The Greatest Showman with a few festive and Halloween inspired films thrown in for good measure. 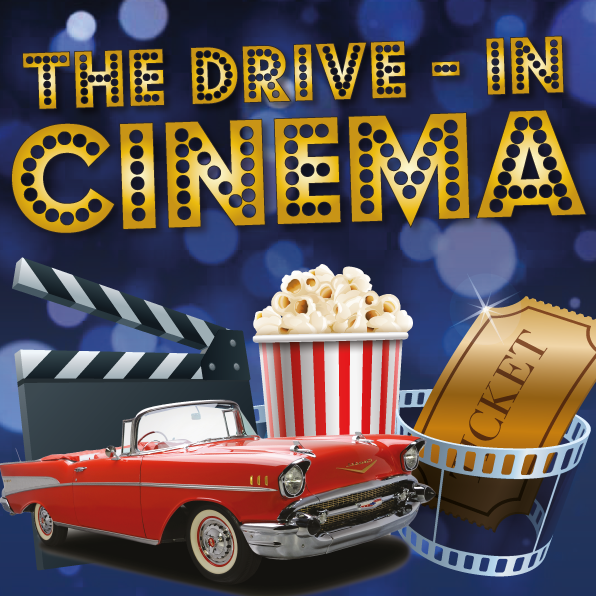 Prices for The Drive in Cinema are £27.00 per car (up to 7 occupants) or £32.00 for VIP which guarantees you a space in the first two rows right in front of the screen. Spaces are first come first served and with the park opening two hours before show time it's best to get there as soon as you can for the best spot. Parking positions are allocated by the stewards who guide you to an available spot depending on the size of your vehicle. Once we were shown to our space we decided to go for a wander before show time. 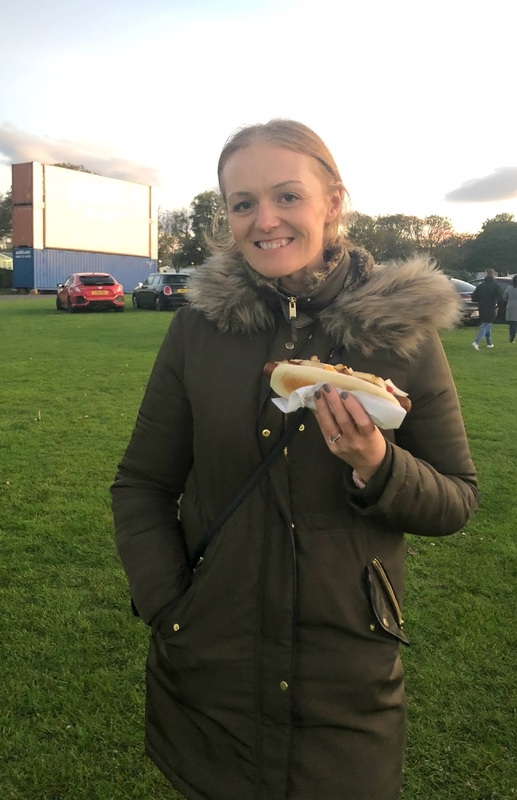 If you want to go for the full Drive In Cinema experience you can grab yourself some scran from the food stalls in the park who serve up burgers, hot dogs, popcorn, nachos, waffles, crepes and drinks. After a quick walk along the seafront we made our way to the food trucks for some food. We didn't think the food prices were too bad, a tray of chips will set you back £2.50 with a large popcorn £3.50 and combo meals on offer for extra savings. Of course we opted for cinema classics, a Cheese Dog for me (£4.00) and a Hotdog for Simon (£3.50). We made our way back to the car in plenty of time for the 6:45 pm show time and got ourselves snuggled up in the car. 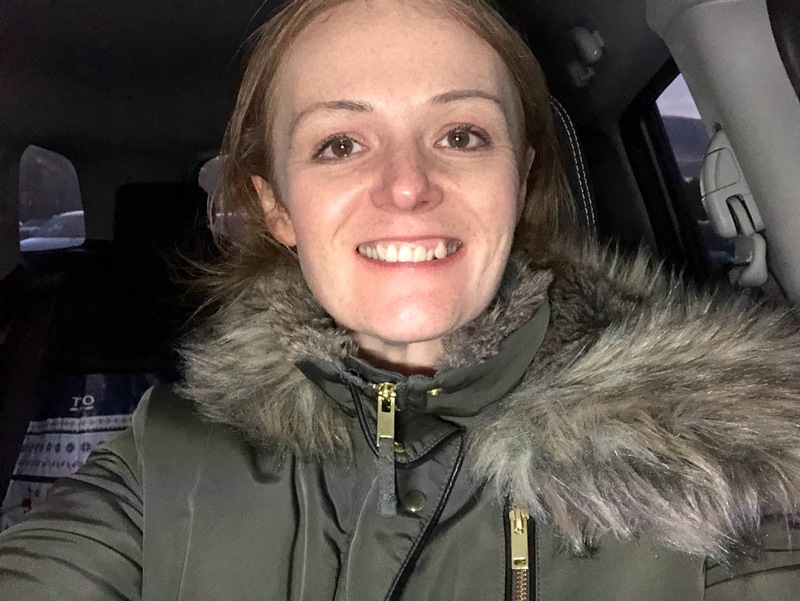 Despite it having been a pretty warm Autumn day in the North East we were fully prepared for a cold evening just in case and our back seat was covered in hats, gloves and blankets (Simon had to stop me bringing our duvet with me!) - and we didn't need any of them! We were more than comfortable wearing our coats over jumpers and I wasn't even a little cold. Following the instructions on the screen we tuned our radio into the FM frequency so we could get the film audio into our car. Having never done something like this before I wasn't sure how well it would work and if the sound would be good quality so I was really surprised when our radio easily tuned in and the film came through our speakers crystal clear. 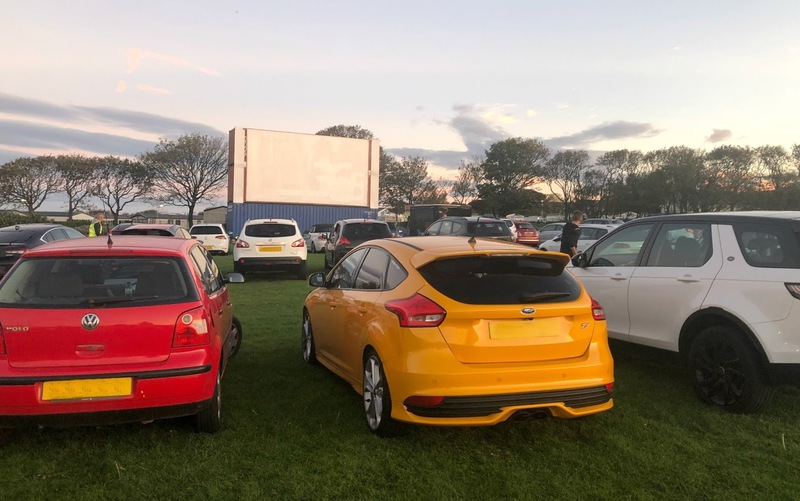 One of the things I was wondering about before we went to the Drive in Cinema was if you are turning up in a car packed out with people can the passengers in the back seat actually see the screen? So I decided to hop into the back of our car for a look and unfortunately the answer is no! Unless I was sat at a pretty awkward angle and practically lying across the back seat, there was no way I could see the screen comfortably. So to really enjoy the experience I recommend people only sit in the front of the car. I'm not sure how great the view is further back in the park. Our screening wasn't overly packed out with perhaps 6 rows of cars in total. When vehicles were turning up the stewards were definitely taking their time parking the cars with lots of distance behind the vehicles in front to maximise the view. Larger cars and people carriers were parked at the sides so that they didn't obstruct any views so I'm pretty confident that everyone in Bents Park could see the screen with on problems. As the film began with that classic opening of Danny and Sandy at the end of their Summer romance I had the biggest grin on my face. It had been a while since I'd seen the movie and seeing such a classic at the Drive In Cinema felt pretty special. Watching a film just the two of us in our car gave us the freedom to fully enjoy the film without worrying about anyone else around us. We ate sweets, looked up facts about the movie (did you know that Elvis was originally asked to be Teen Angel? ), discussed our favourite scenes and, of course, I used my bottle of coke as a microphone and belted out every song at full (very out of tune) volume. Simon was slightly bemused when I threw my "microphone" in his direction during the male parts and although he was having none of it he did enjoy his evening. Our experience was over before we knew it and with departure of the site as effortless as arrival I was very impressed with the organisation of the Drive in Cinema. Everything ran so smoothly and the stewards in the park were so helpful - it's one of the best organised events we've ever attended. I highly recommend a trip to the Drive in Cinema at South Shields if you want to do something really fun and different this Autumn. We will definitely be booking ourselves tickets if they come back next year! 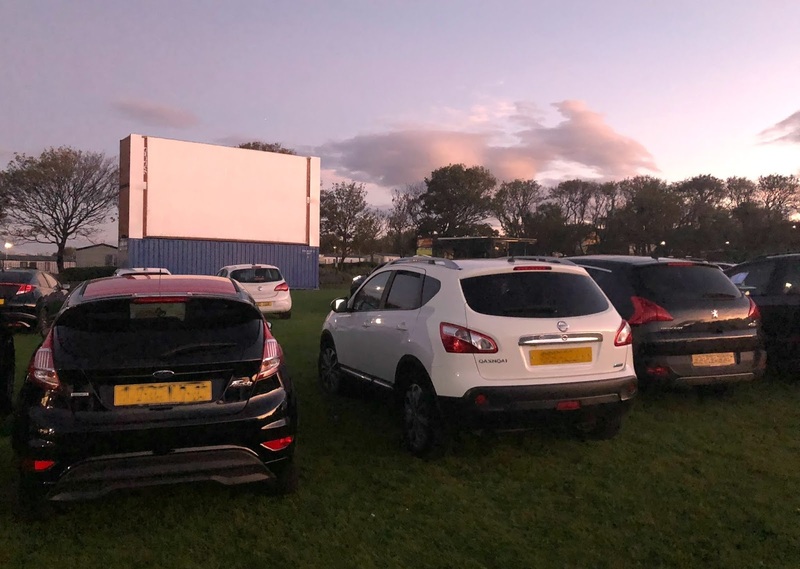 The Drive in Cinema very kindly gave us complimentary tickets with no requirement to write this blog post, however we loved it and wanted to share our experience! Although I obviously love my food whatever the season, Autumn is my absolute favourite time of the year to truly indulge in the best restaurants in Newcastle. There's something about the sudden drop in temperature and darker nights that makes me crave comfort food. Getting cosy in a dark corner stuffing myself with hot soup, stodgy pies, fruity crumbles and freshly harvested vegetables is my idea of heaven and the very best way to welcome the change of season. Is it just me or is Autumnal produce just the best? So I thought I'd pull together a small collection of the best restaurants in Newcastle for comfort food this Autumn - these are my favourite spots this time of year, not just for their amazing seasonal menus but also for their wonderful atmosphere. I think you could manage to quite easily get round them all before Winter! Enjoy! 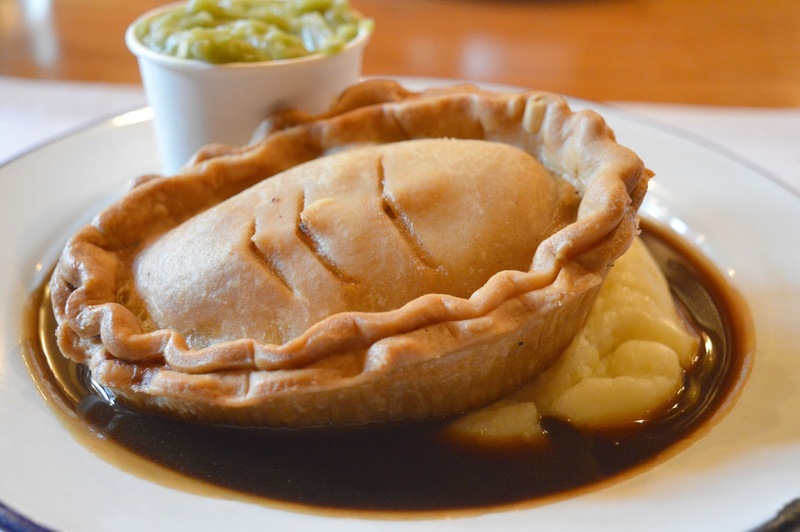 When I think of comfort food pies are probably the first thing that pop into my head and you wont get any better in Newcastle than RedHouse. Buttery pastry, delicious hot fillings, lashings of thick gravy and, especially for the Geordies, Pease Pudding. The ultimate treat on a dark cold evening! The restaurant is a maze of dimly lit hidden corridors, cobbled floors and secret corners, it really is the perfect place to dine in Autumn. Blackfriars is one of our favourite places to head in Autumn, as they cook with seasonal local produce their menu truly comes alive this season with pumpkins, blackberry sorbets and Autumn roots. The old friary is a real escape from the outside world and its so dark and cosy it's the best place to escape a blustery Autumnal day. Cosy pubs in the Autumn are a must and I have to say The Forth is Newcastle's cosiest. Surprisingly spacious on the inside it's a maze of secret corners and its hearty pub grub really warms up your belly. Their weekly pub quizzes and Sunday lunches make it the ideal place for an Autumn gathering with friends. 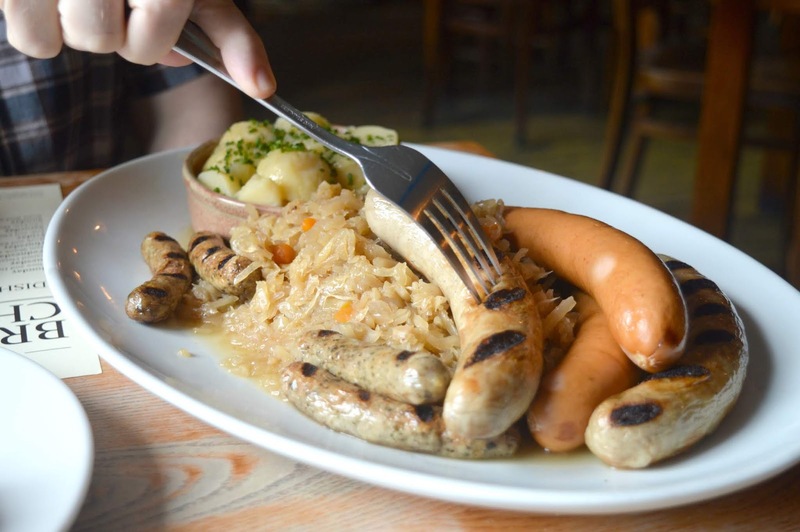 The Broad Chare's annual Oktoberfest menu truly kicks off the Autumn season in Newcastle and although you are too late to enjoy it this year, their menu is fully loaded with seasonal treats to keep your warm this Fall. Serving some of the best beers in Toon, and with a cracking menu, The Broad Chare is small, cosy and has a really love atmosphere. This one is a little different to the others as it isn't actually a restaurant but I really couldn't write a post about Autumn comfort food without mentioning Redheads Mac n Cheese because they are a must for this time of year. Easily my favourite street food vendors in the North East you can find them at the Quayside Market every Sunday and grabbing a pot of piping hot mac n cheese to enjoy whilst strolling along the Tyne is the best way to spend an Autumn afternoon. If you are yet to try Dobson and Parnell then you have to give it a go this Autumn because they are another of my favourite restaurants for serving the very best seasonal produce. Their exposed lighting, dark interiors and plush leather booths make them a great place to to hide away in this Autumn and their ever changing menu always delivers. 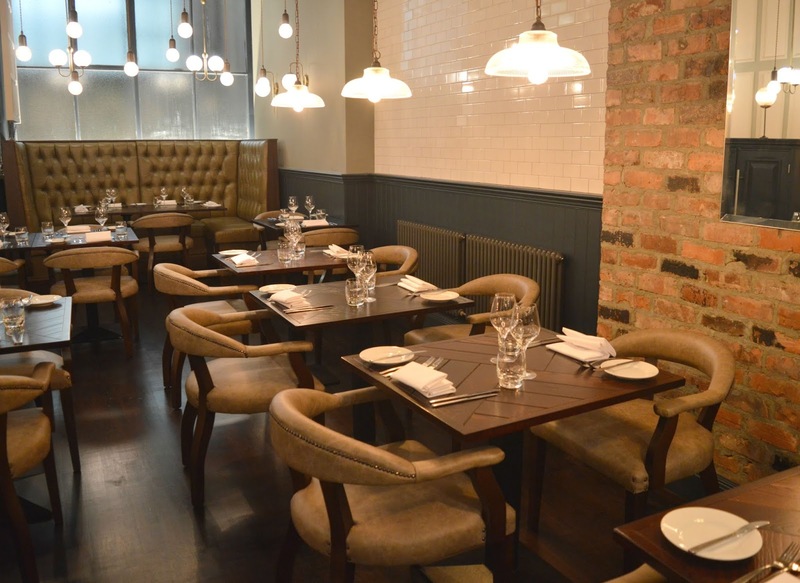 Those are just a few of the best restaurants in Newcastle for comfort food this Autumn. I'm sure there are many more so please do make sure you let me know your favourites! If I were to ever sit down and work out how many hours I waste on Instagram I think I'd be pretty shocked. Scrolling through picture perfect images is my favourite way to procrastinate and if I have something important to do you can guarantee that rather than getting on with it I will find myself gazing at Instagram! 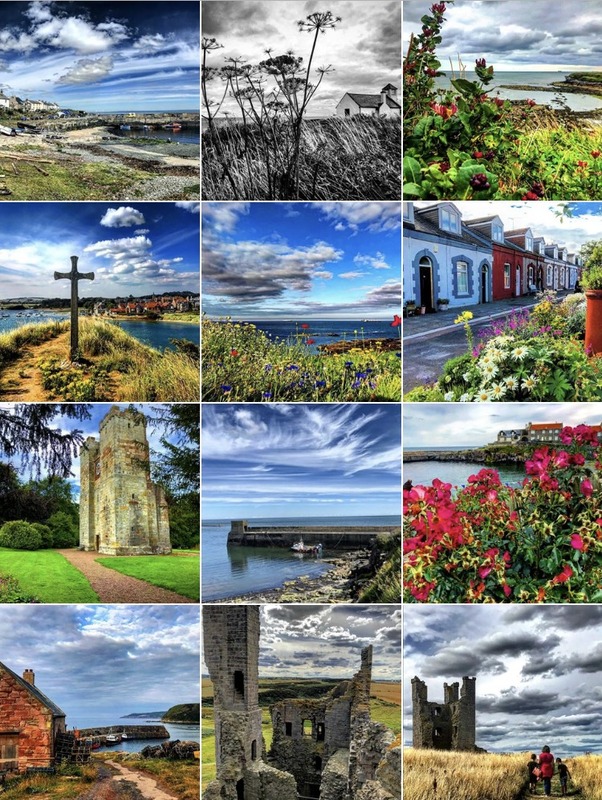 So today I thought I would share with you my favourite North East Instagram accounts. 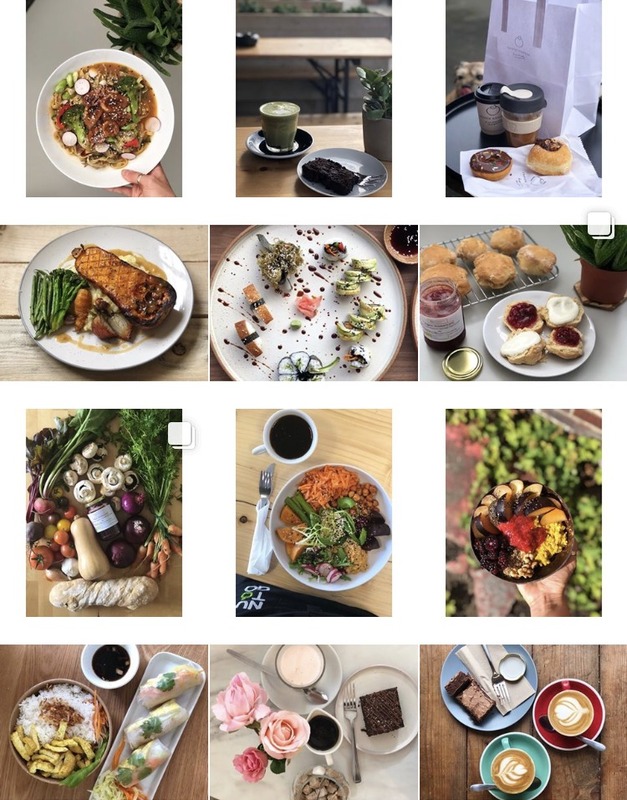 Each one of these accounts shares photographs that show off our region in the very best way - whether it's beautiful scenery, food to make your mouth water or incredible adventures. These people aren't insta famous, they don't have thousands of followers, they are just normal people taking amazing photographs because they love where they live and want to shout about it, and in my mind those are the very best kinds of people on Instagram. Enjoy and please do let me know if there are any other amazing locally based Instagram accounts that I've missed! Kelly is a 20 something arts graduate with a great eye for capturing Newcastle. Her feed is a fabulous collection of bold photographs which quite often show places I stroll past without a second thought look truly beautiful. I especially love her building and landscape photography and each time she posts a photo I find myself falling in love with the North East all over again. 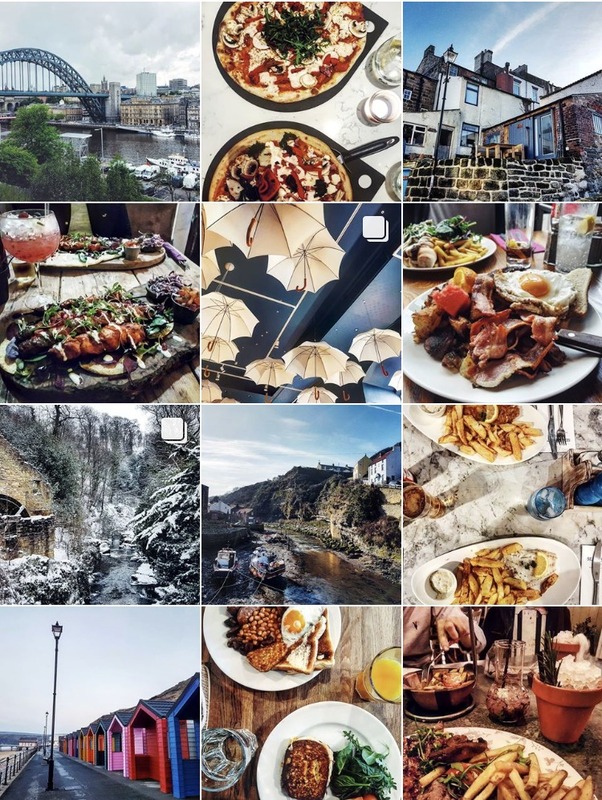 Karen is another lady who knows how to show off the North East and her food photography is so inspirational I've often found myself making food plans after losing far too many hours drooling over her latest discoveries. When Karen's not sharing her scran she enjoys a spot of globe trotting which basically makes her Instagram feed picture perfect. Katie is a lass from Sunderland who I've been stalking on Instagram for a while now. 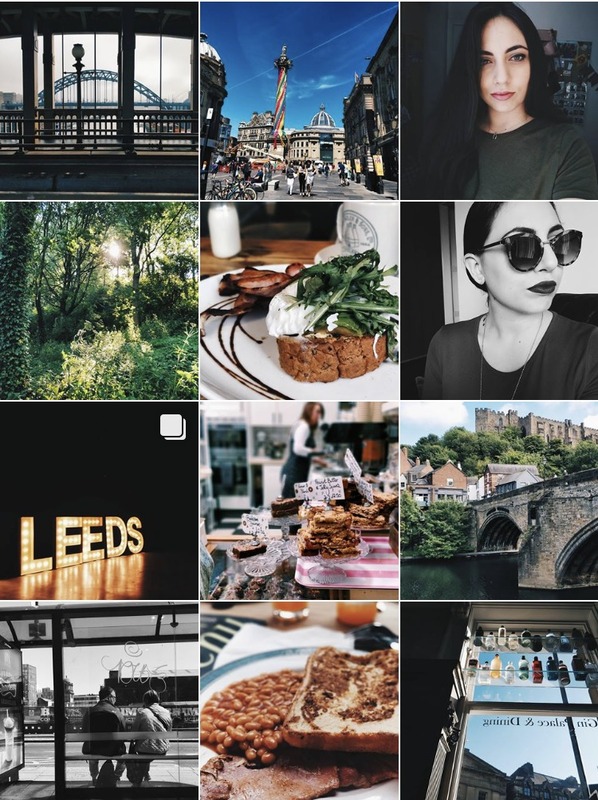 The dark hues of her photos really make her images pop and she's the Queen of discovering the best spots for coffee (if you want to know where the most beautiful coffee shops in the North East are you really need to give her a follow! I am obsessed with Emm's photographs and her Instagram is one huge colourful adventure that immediately wants me to explore more of our beautiful region. 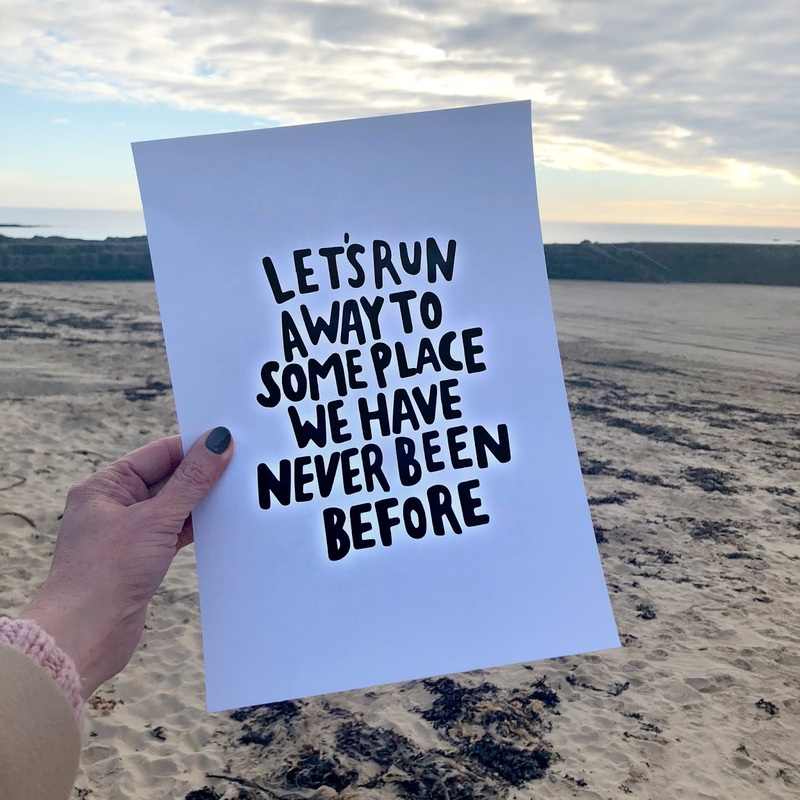 Emm's talent doesn't just end with creating a stunning Instagram, she's also the creator of The Little Confetti Company designing hand lettered gifts and cards. Amy is the absolute queen of taking the most beautiful photographs of Newcastle. 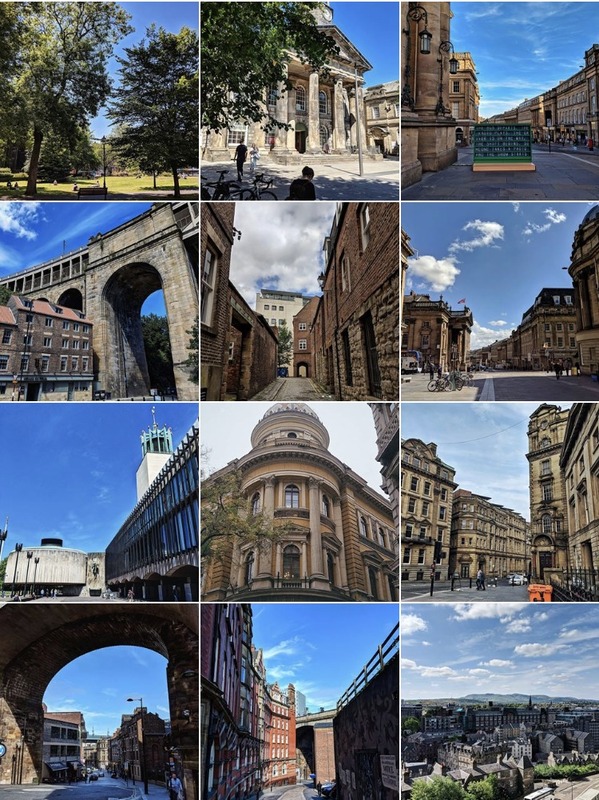 Most of the pictures she shares are of the city and she really has an eye for detail and is so skilled at picking out the most beautiful architecture to share. She has opened my eyes to so many buildings in Newcastle that I have never noticed before. A quick glance at Zoe's instagram account and you'll immediately fall in love with our dramatic North East coastline. With splashes of vibrant colour, Zoe's photographs are a daily reminder of how lucky we are to live in such a beautiful part of the country. She has a real knack of finding unique view points and I'm always amazed by her wild flower shots at the Northumberland coast. 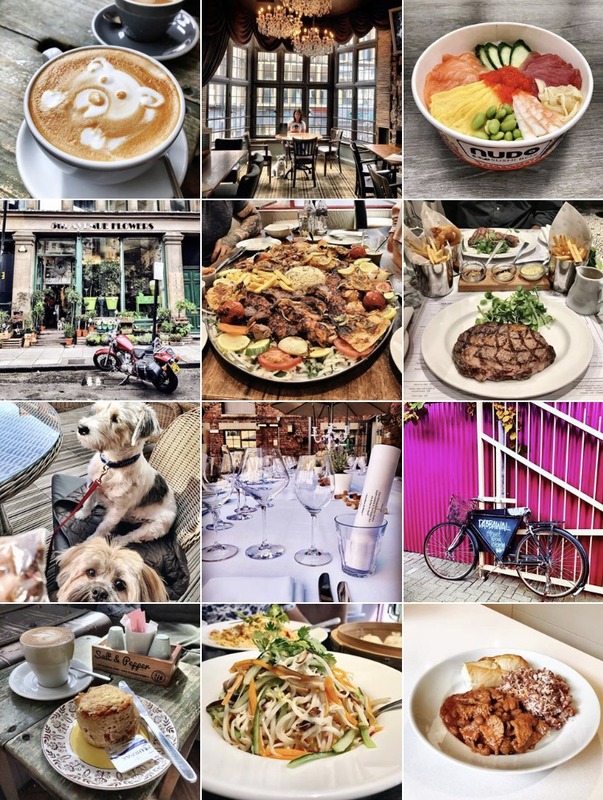 A Slice of the Toon is one of my biggest North East Instagram obsessions, with a great collection of inspiring adventures and the most delicious food photographs my "must try" list will forever be full thanks to this Instagram account. Probably best not to scroll this one with a hungry tummy! 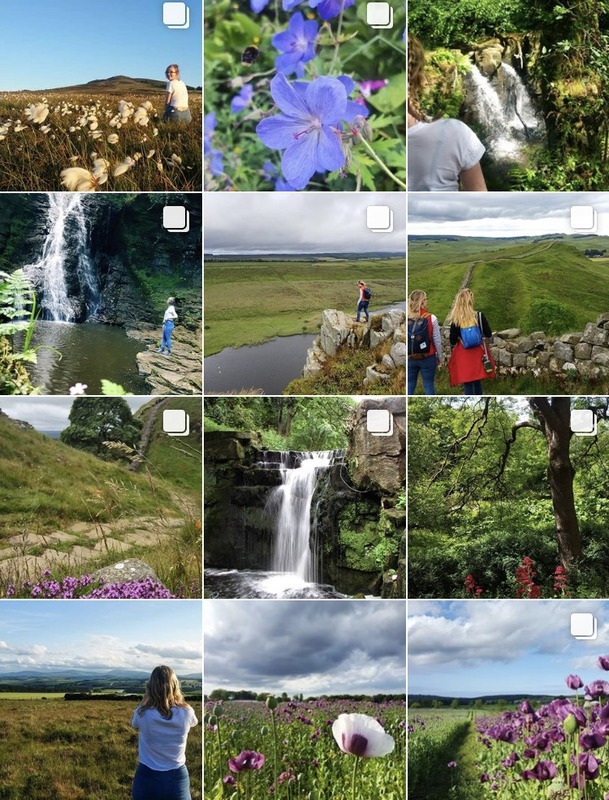 Lucy loves an adventure in the North East and her Instagram is full of the greatest looking walks and adventures. Lucy lives her life to the full and always makes me want to grab my hiking boots and go on an adventure. If there's a hill to climb or a waterfall to discover you can guarantee that Lucy will be there! She makes me wish every day that I had more time to truly explore the North East. Being a blogger I sometimes bump into the local press at events and by far my favourite is the lovely Katy, who I once had the pleasure of sitting next to at a press dinner. 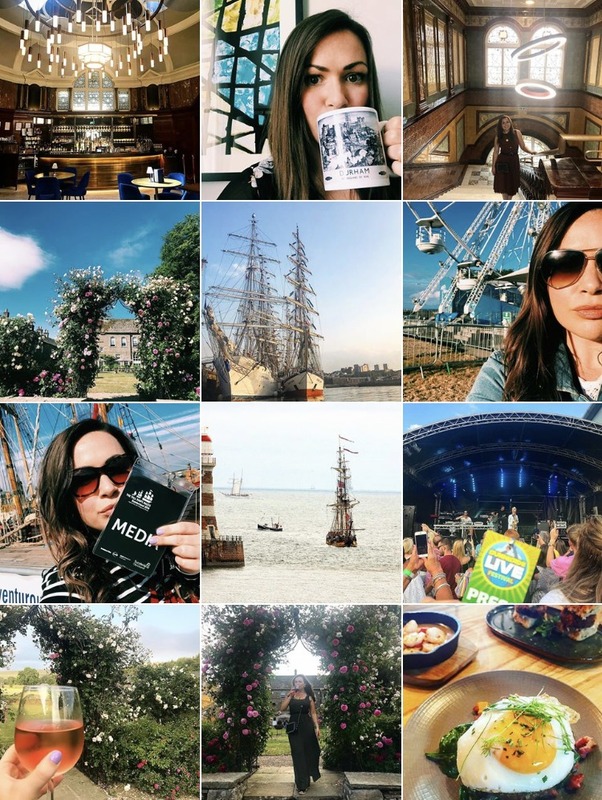 Writer at the Sunderland Echo, Katy's job takes her all over the North East sampling the region's best hotels, restaurants, bars and experiences and every day she's sharing somewhere amazing on her Instagram. 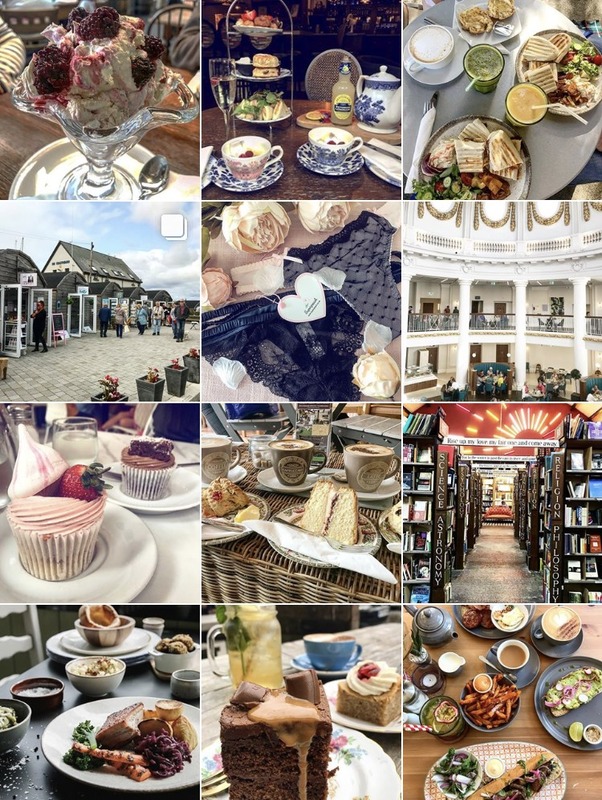 My latest discovery on Instagram, I'm pretty new to The Squeaky Peach but am already hooked on all of the delicious North East food to be found on the grid. 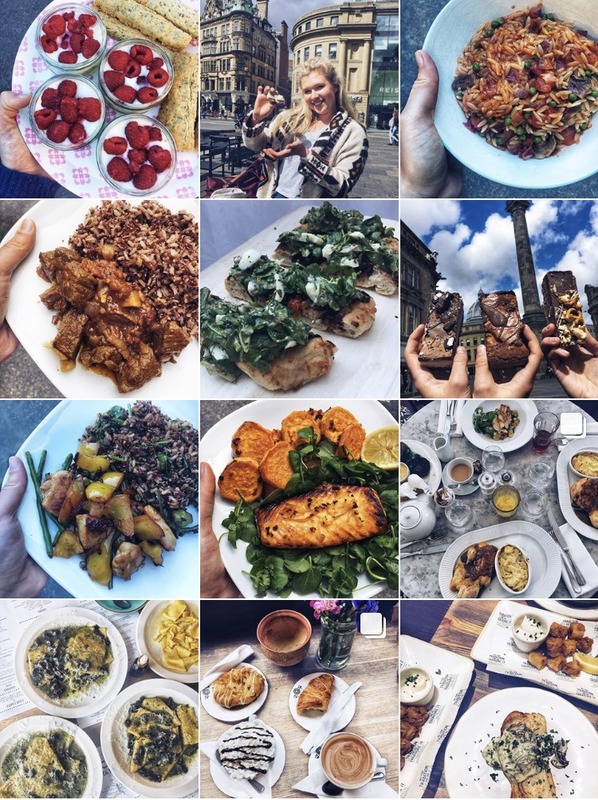 A great one to follow if you're vegan, I'm always inspired by all of the colourful dishes with plenty of places that I'm yet to try to add to my list. I think you'll agree with me that all of these accounts are very inspirational and as I'm always looking out for more please let me know if I've missed your favourite! A couple of years ago I wrote this guide to the 10 best breakfasts in Newcastle and whilst I still enjoy eating at every single one of the places that I mentioned, times have certainly changed and brunch culture in the North East is far more alive than it used to be. 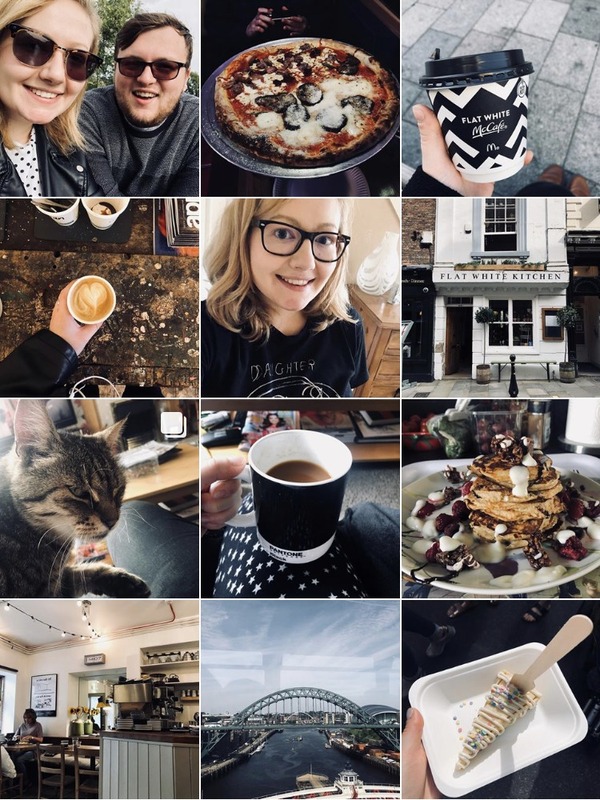 Over the last few years I have discovered the best breakfast dishes and brunch time treats in the North East and thought it was about time I shared! So here it is, the ultimate guide to the best breakfast and brunch in Newcastle, North Tyneside (and beyond). Make sure you let me know if I've missed your favourite. The cutest little cafe in Tynemouth, Dil and the Bear is one of my favourite places on the coast for beautiful food in a wonderful setting. Although we usually stop by for coffee and cake we've recently discovered it's a great spot for breakfast. With a menu full of tempting dishes, the Sweetcorn Fritters topped with Bacon, Avocado and Fried Egg is my favourite and, the best thing about brunch in Dil and the Bear is that if you can grab a cake to take out afterwards. Judging by the queues that form down the street outside Flat White Kitchen within minutes of it opening I'm not sure I really need to be telling you about it as I'm sure everyone knows! Their mammoth pancake stacks are legendary and waiting outside to get your bum a seat in this gorgeous little place in Durham is well worth it. Their pancake menu is often updated with new flavours but the classic Buttermilk Pancakes with Maple Syrup is my favourite. 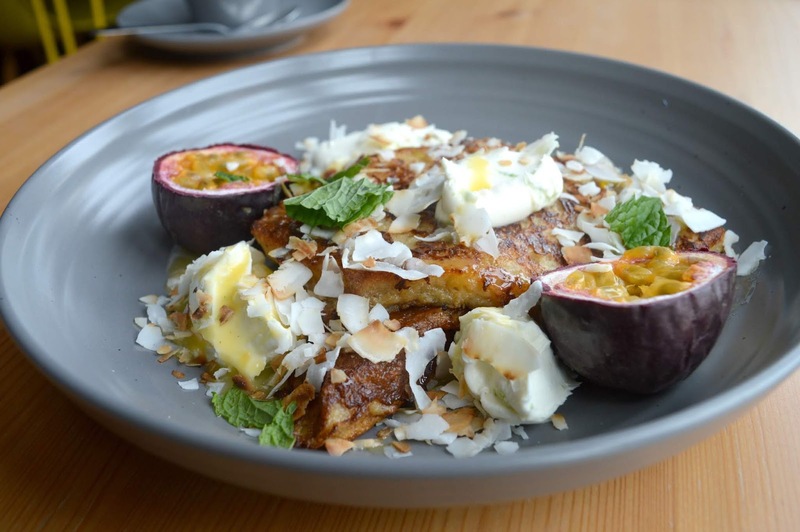 Read my full review of breakfast at Flat White Kitchen here. The Boatyard in Cullercoats is very cosy and pretty tiny so getting a table is a bit of a moment to celebrate. I've walked past so many times when it's been full but when we finally managed to bag the last available table one Saturday morning we both agreed it had been worth the wait. Pushing the boat out and ordering the Full English is well worth it - the Northumbrian Sausage is beautiful and, if your feeling extra fancy, a Mimosa on the side is a must. I was so excited when I heard that we were finally getting a Filmore and Union in Newcastle, then we got two. The small cafe in Jesmond is lovely and cosy and the larger offering in John Lewis Eldon Square ensures you'll actually manage to get a seat! Their breakfasts are all prepared with fresh food using healthy cooking techniques and the dishes are all filling, delicious and nutritious. I highly recommend their Gluten Free Winter Spiced French Toast with Greek Yoghurt and Plums - so good! Read my full review of breakfast at Filmore and Union here. If you want the very best pancakes in the North East for breakfast then Monsieur Crepe Cafe in Heaton is the place to go. It's also worth knowing that you can phone up and book a table so no need to break into a sweat trying to get there for opening to make sure you can get a table. Their menu is huge with every pancake topping you could possibly imagine. The Banana, Ginger Crumb and Salted Caramel crepe is my favourite and the perfect way to start your day. Read my full review of breakfast at Monsieur Crepe Cafe here. Resisting the cakes on the counter when you place your breakfast order is a bit of a challenge at The Post Box in Ponteland, but as long as you have the willpower to resist the sweet treats you will find some delicious savoury dishes on their breakfast menu including my favourite, the Halloumi Poacher - perfectly runny poached eggs served with halloumi in wholemeal toast. Read my full review of breakfast at The Post Box here. Read my full review of breakfast at The Great British Cupcakery. The Garage in Ouseburn saved my morning a few months ago when I was wandering about looking for breakfast and everywhere I tried was shut or having kitchen dramas. By the time I crawled into The Garage I was so hangry and they really rescued me with the most incredible mushroom on toast. The quirky little cafe is inside an old car garage and comes with perfect interiors as well as incredible food. Cafe 19 came so highly recommended to me by so many people that I just had to go and visit them and I can see why so many residents in Whitley Bay love to pop into the cafe for their breakfast. Their pancake menu comes with so many topping choices that I tend to stand at the counter debating for at least 5 minutes about what to order (never stand behind me in the queue!) Next time I go I'm definitely going for the English Skillet - a full fry up served in a frying pan. 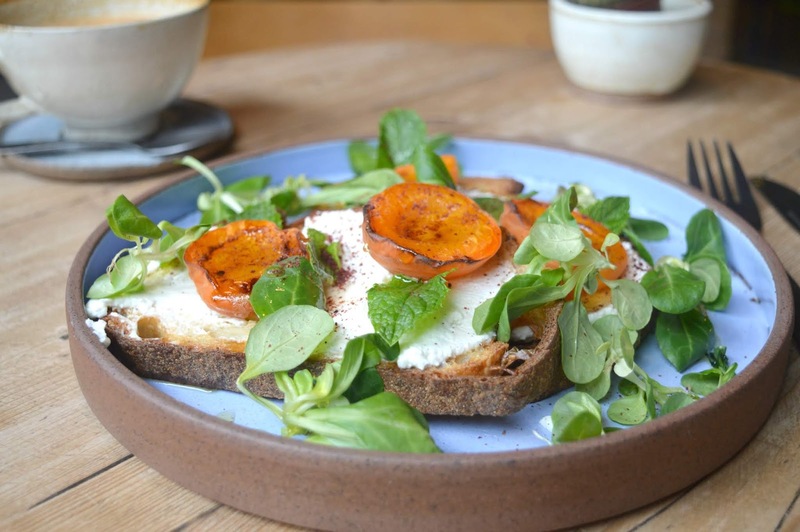 If you prefer a healthier start to the day then Dirt Health in Heaton have you covered with their menu full of freshly made dishes crammed full of local produce and delicious flavours. 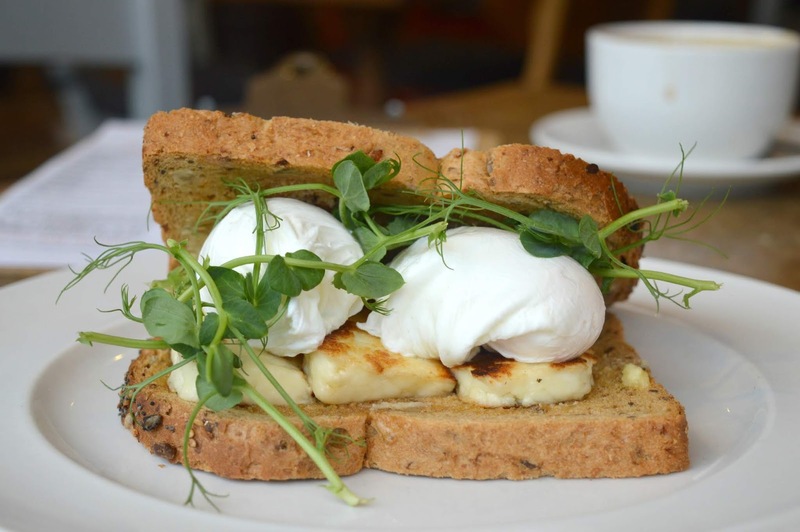 One of the best vegetarian and vegan offerings in Newcastle they welcome everyone into their place to enjoy some of the most colourful breakfast dishes you'll find in the North East. I highly recommend the Sweet Potato Pancakes served with Coconut Caramel and Banana. One of the most popular places for breakfast, you really haven't lived your North East life to its full potential until you've been into this lovely little place in Whitley Bay. 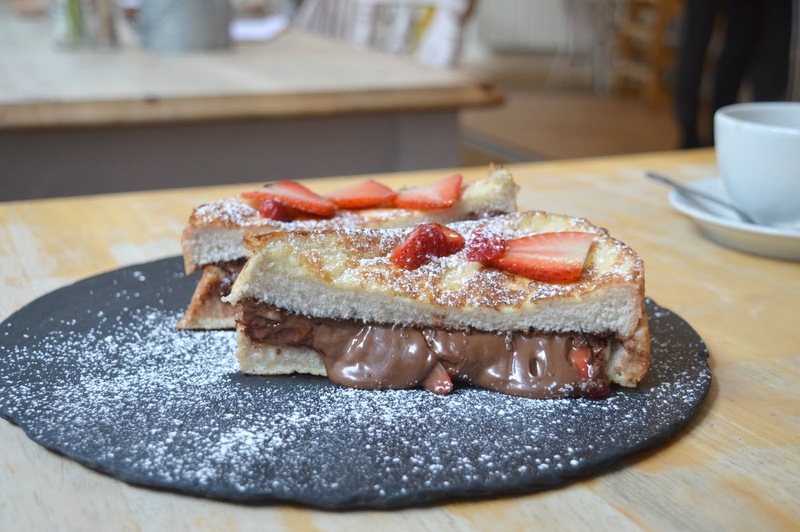 Their breakfasts are perfect and they are masters of French Toast offering seasonal variations every few months. Kith and Kin is one of those places where you want to revisit every week just to make your way through the entire menu. I've been recommending Kiln in Ouseburn to anyone that will listen, it's my favourite place in Newcastle at the moment and their brunch dishes really hit the spot. My favourite discovery is the Baked Apricot on Sourdough Toast but every time I visit there's something new on the menu that takes my fancy - their dishes are ever changing and if you're passionate about your food this really is a place you need to check out. 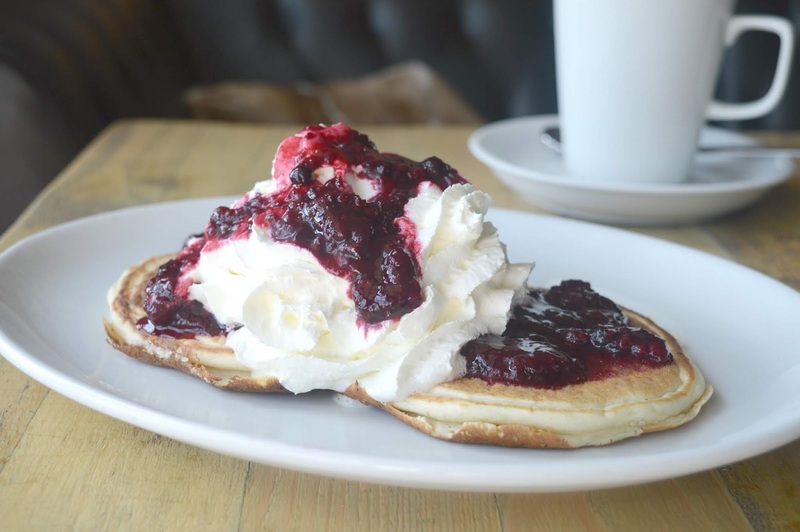 Obviously this is just a very small handful of some of the best breakfasts in Newcastle, North Tyneside and Durham and there are so many that I'm yet to discover so if your favourite hasn't made the list please do share!